Available as low as $4.99 per bar over spot! Geiger Edelmetalle produces some of the finest investment-grade silver bullion for sale in the world today. The German mint is one of the world’s oldest, continuously operating precious metal facilities and is located in the heart of Germany’s silver mining country. 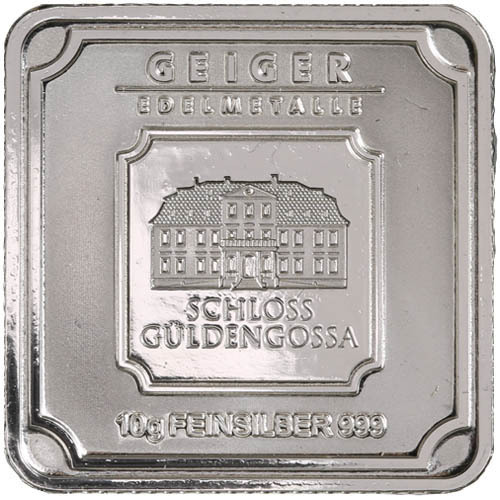 Today, 10 Gram Silver Geiger Square Bars are available to you online at Silver.com in the new Geiger Original collection! Ships to you sealed in individual security capsules, tubes of 30 bars, or boxes of 480 bars! Part of the Geiger Original Series! Consists of Ten Grams, or .321507 Troy ounces, of .999 fine silver. Obverse bears the popular design of Schloss Guldengossa. Reverse features the security logo LEV rhombus in a repeating pattern along with an individual serial number. Ideal for Precious Metal IRAs. Silver bars for sale in the Geiger Original Series are both unique and diverse options for any investor. First and foremost, you’ll find impressive diversity in this collection which runs the gamut of weights from 1 Gram all the way up to 5 Kilograms of total silver content, all of which feature .999 silver purity. 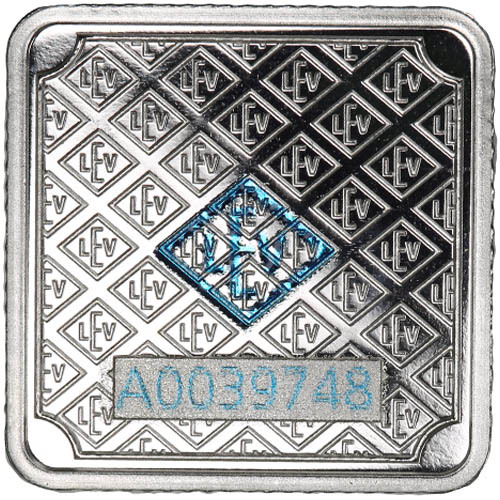 As for unique, the Geiger Original Series bars have beautiful designs along with security elements that make them one of the most advanced silver bar collections available today. There are four features of the physical design alone in these bars meant to protect against counterfeiting. Included in the design on this side is a pearl finish surface to combat counterfeiting, and as you flip the bar to its reverse face you’ll notice a ribbed edge which has become customary in the striking of bullion coins. The reverse of the 10 Gram Geiger Square Bar includes the repeating pattern of the LEV rhombus. This side of the bar includes a printed, unique serial number and a textured, high-relief design finish. Physical security features on this face include the use of a UV-coating on the bar that includes the manufacturer LEV rhombus logo in the center and a layer over the serial number. Both the highlighted layer over the serial number and the LEV rhombus are not visible without the aid of a black light. Please feel free to reach out to Silver.com with your questions. We’re available on the phone at 888-989-7223, on the web using our live chat, and via our email address.